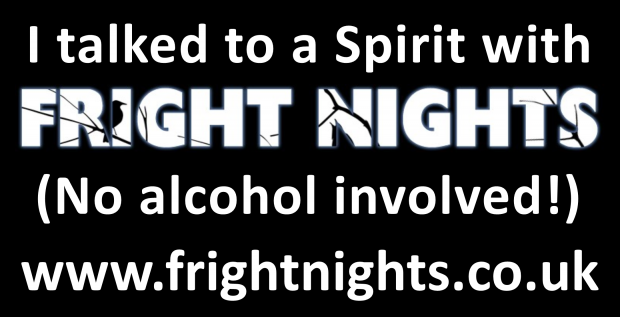 Fright Nights Competitions - win amazing prizes every month! Fright Nights Competitions - win amazing prizes every month! Why not come and pay us a visit on Stand C56 in the Find Me Out Zone. 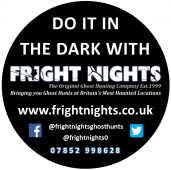 Many people are looking for something different to do on a first, second or third date these days…..
Why not try Ghost Hunting with Fright Nights? Don’t forget to buy a Raffle Ticket (for each day) to be in our Draw for the following prizes: Only £2 per strip of 5 tickets which can be purchased on the day or in advance by clicking through our Gift Vouchers page. At the bottom click Buy a Gift Voucher and you will see the Raffle Ticket Option, along with our various Gift Vouchers and our VIP Club membership details which will be on offer at the show. The Draw will take place at 4.30pm on both Saturday 29th June and Sunday 30th of June. 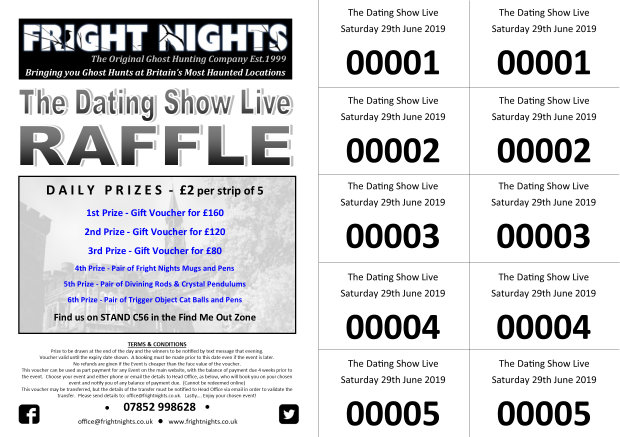 The Dating Show Live TICKETS: If you are planning to visit the show, why not click this link HERE for a 10% discount on your tickets in advance. Visit our Merchandising shop here and purchase any Fright Nights design T-shirts, caps, bags, badges etc., wear it or bring it with you to the show, visit us on stand C56 and you will be in with a chance of winning one of the many Ghost Hunting Tickets for two that we will be giving away at the event. Also, wear any branded item to one of our regular Ghost Hunts to be in the Annual draw to win FREE GHOST HUNT GIFT VOUCHERS.